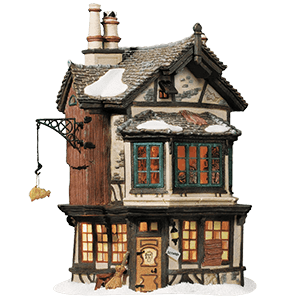 Inspired by the architecture, history, and people of Victorian England, our Dickens Village collection by Department 56 includes the buildings and people needed to create your own Dickensian holiday display. The gorgeously detailed holiday village buildings are all made of porcelain and have been painted by hand with exquisite attention to detail. Snow accents the rooftops of shops, cottages, pubs, and more, and many of these holiday buildings light up or feature an animated or audio aspect that will add a special touch to your holiday display. Be sure to populate your Dickens Village with the matching villagers. 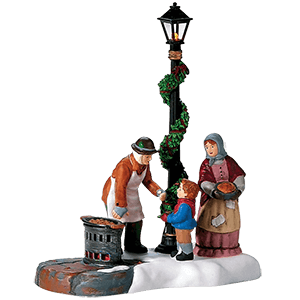 Our Dickens Village figurines range from carolers, shopkeepers, children at play, and pub patrons to porcelain Christmas trees and horse-drawn wagons that will add extra authenticity to your display. Based on the most charming details of Victorian society and named after famous author Charles Dickens, our Dickens Village buildings and figures are ready to become part of your own holiday traditions. Inspired by Charles Dickens tale, A Christmas Carol, this Department 56 village collection brings the holiday classic to new life. Dickens Carol was one of the single greatest influences in rejuvenating the old Christmas traditions of England. Celebrate Christmas in your heart and home with this beautiful holiday village set. These Christmas Carol buildings include designs inspired by locations described in the story, such as the home of the poor-but-loving Cratchit family, Scrooge and Marleys miserly office, and the cheery residence of Scrooges spirited nephew, Fred Holiwell. Each illuminated porcelain building shows off Victorian England architecture for a unique period look. The snow-topped holiday village buildings are decorated with bright colors and intricate detail. Many of these pieces can be plugged into an electrical outlet to spread a cheery glow throughout your wintry scene. Decorate for the season by setting up a fantastic Christmas Carol village display in your home! 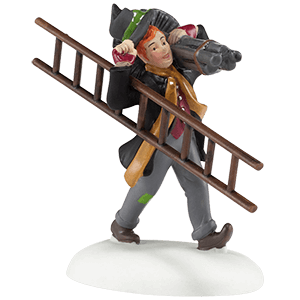 Recreate the classic tale of Ebenezer Scrooge and his holiday lesson with the help of the Dickens Christmas Carol figures from Department 56! We carry charming porcelain figurines and village accessories inspired by Charles Dickens popular Christmas story. Bring home colorful characters from the narrative like Scrooge and his ghostly visitors, Bob Cratchit with Tiny Tim, and guests from Fred Holiwells Christmas party. Each hand-painted figure shows incredible detail and bright colors that will look wonderful in your wintry village display. These collectible village figurines feature fun styles suitable for the Victorian England setting of the tale, making them excellent options for adding Christmas cheer to your miniature town landscape! The architecture, customs, and history of Victorian England pervade the pieces of the Dickens Village collection by Department 56. We are pleased to offer a wide selection of distinguished and quaint shops, cottages, and other snow-topped buildings with period charm and holiday style. Our Dickens village shops include a tea room, an engraver, a luthier shop, several pubs, a solicitors office, a millinery, and more. Other fun structures range from a theatre to a chapel to a distillery, offering plenty of options to add character to your miniature town. Many of these pieces can be plugged into an electrical outlet to spread a cheery glow throughout your wintry scene, and several offer additional animation or audio features that make them truly amazing collectibles. 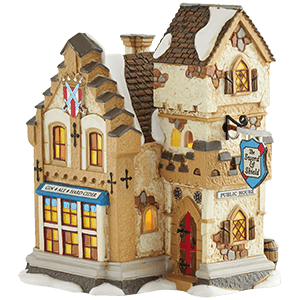 These illuminated porcelain buildings feature bright colors and intricate detail perfect for any holiday village display. Fill your Christmas village with colorful characters from Victorian England with the Department 56 Dickens village collection! These hand-painted porcelain figures and village accessories show off bright colors and intricate detail perfect for period settings. Choose between children playing in the snow, cozy couples out for a stroll, holiday fair-goers, carolers, ice skaters, and other seasonal figures. Additionally, some citizens look hard at work, such as the town crier, the newsboy, the lamp lighter, festival musicians, the chimney sweep, the fish and chips seller, the tea monger, and other shopkeepers. These holiday village figurines work great for populating your miniature town, and they are sure to become favorite Christmas decorations to set out each year! You have been incredibly helpful and assisted with every possible need. Your quick responses and adjustments have been insightful and met our needs. Thank you again!